President Barack Obama announced today measures to increase the ability of people with disabilities to live at home, rather than in institutions. Today marks the 10th anniversary of the U.S. Supreme Court decision Olmstead v. 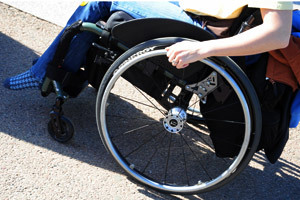 L.C., which said that making services for disabled people available only in institutions and not at home violated the Americans with Disabilities Act. Scant progress has been made toward that goal, and disability advocates have been disappointed that the issue has not thus far figured in the administration's health care reform plans. "The Olmstead ruling was a critical step forward for our nation, articulating one of the most fundamental rights of Americans with disabilities: Having the choice to live independently," President Obama said in a statement intended to kick off what he termed "The Year of Community Living." "I am proud to launch this initiative to reaffirm my Administration's commitment to vigorous enforcement of civil rights for Americans with disabilities and to ensuring the fullest inclusion of all people in the life of our nation," Obama said. Currently, services in nursing homes are mandatory for Medicaid recipients, while services in the community are optional. Tens of thousands of people who live in institutions such as nursing homes, rehab centers and state hospitals around the country would rather receive services at home. With the appropriate assistance, such as an aide to help them get out of bed, dress and bathe, many can do so. In today's announcement, President Obama directed Health and Human Services Secretary Kathleen Sebelius and Housing and Urban Development Secretary Shaun Donovan to identify ways to improve access to housing and community services for people with disabilities. The administration also provided more than $140 million in Recovery Act funding for independent living centers across the country, which assist people who want to move out of institutions and into their own homes. "We hope that in 2009, the 'Year of Community,' we can get rid of the entitlement only to nursing homes, and community services become a real choice," said Bob Kafka, a disability activist with ADAPT, a national group that has pushed for the Obama administration to address long-term care as part of its proposed health care reforms. Sebelius announced today that her agency would be providing grants to help states offer more community services to people with disabilities. The administration also said that HUD will provide additional Section 8 housing vouchers to help people with disabilities move from institutions into the community. The lack of affordable, accessible housing is a significant barrier for people seeking to move back home. Disability groups were pleased with today's announcements, but most continue to hope that the president's plans to change the health care system will address this issue and end a system that makes institutions the first option for people with disabilities. "The elephant in the living room is the fact that we're doing health care reform right now," said Andrew Imparato, president of the American Association of People with Disabilities. "None of today's statements talk about dealing with the institutional bias now that we have the attention of Congress on health care reform."